T-Mobile one of the most active Windows Phone supporters in the United States is giving up on Microsoft's mobile platform, which makes sense considering the Redmond-based company's latest moves in the smartphone space. 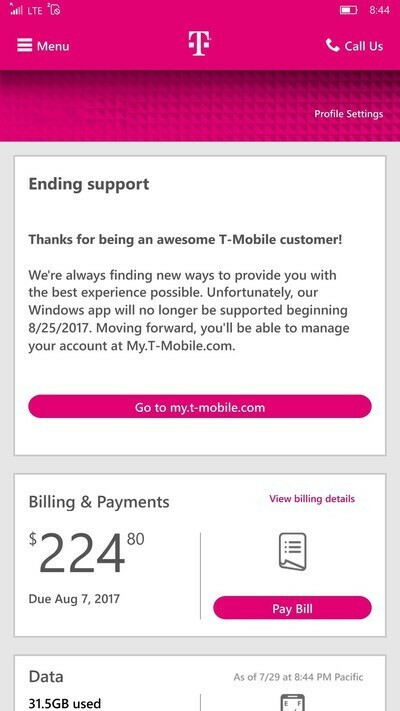 The Uncarrier has started to send messages to some of its customers to let them know the T-Mobile app for Windows Phone will no longer be supported beyond August 25, 2017. What does this really mean for T-Mobile customers who own Windows Phone handsets? Well, after August 25, they will be forced to use the carrier's website to check their accounts instead of the mobile app that's now still working. Thanks for being an awesome T-Mobile customer! We’re always finding new ways to provide you with the best experience possible. Unfortunately, our Windows app will no longer be supported beginning 8/25/2017. Moving forward, you’ll be able to manage your account at My.T-Mobile.com. T-Mobile's decision comes in line with its previous decisions, as the carrier removed the last high-end Windows Phone handset, the Alcatel Idol 4S, from its portfolio a few months ago. However, we can't help but wonder if T-Mobile will revive the app if Microsoft is back with more Windows Phone handsets. Fornth3 software process that Microsoft had, Windows Phone is a total disgrace and a terrible abomination vs what it should/could have been. I had high hopes until Untried to WP7 devices which appeared to just be a sk8n on top of Windows Mobile. I tried WP8 bit it sucked too. WP10 looked promising and I considered buy a Lumia 950XL. But once i triwd it out, it just made me angry and after reasin MS wont even be supporting th3 device soon, I decided its not worth the time to use the phone at all. Shame on them for wasting people's time and money on this worthless BS. So glad i didnt. People actually *use* the bloated Carrier-apps?? Why not? It's an app for viewing your account, balance, usage, change devices/plan features, pay your bill etc. It was actually nice to have when I used T-mobile. Some are pretty good/ useful. I like using the Verizon Messages+ app over the standard Android Messenger. [OFF TOPIC] Please, any t-mobile subscribers here? Kindly help me get a SIM unlock code for a Lumia 521 with IMEI: 355913051801822 . I've tried just about all online unlocker, but none could unlock the T-mobile variant. PLEASE, HELP!!! Send the code to Franklynthaddeus@yahoo.com Sorry for flooding the comment section. Call Tmobile. their CS always helps me out with unlocking. Never used it, wasn't very useful. Still don't use it. So no loss.